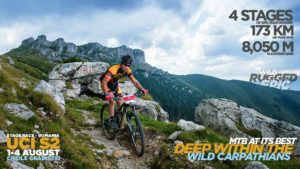 CARPATHIAN MTB EPIC - Wild. Rugged. EPIC. 1-4 August 2019. MTB at its best, deep within the wild Carpathian Mountains, in Romania! Discover the country of Dracula and immerse yourself in a world ancient and unspoiled. Carpathian MTB Epic is the ultimate 4-day old school MTB stage race, offering all-inclusive packages, with a SOLO / individual race format. Carpathian MTB Epic returns for the 3rd edition in 2019, with new tracks and an authentic MTB experience, between the 1st and 4th of August. Registrations are OPEN for all passionate, professional and amateur cyclists at special prices starting with 28 January 2019, on carpathianmtb.ro/en. The event is featured in the S2 category of the International Cycling Union (UCI), giving performance athletes access to 80 UCI points. Carpathian MTB Epic delivers 4 days of pure mountain biking with over 173 kilometres of pedalling and 8.050 meters of climbing in the heart of one of the last genuinely wild regions in Europe – the Carpathian mountains in Romania. Participation is complemented by the all-inclusive experience, which covers everything from accommodations in the Olympic level Race Village to nutrition & meal plans, complete race services on site and on course and top it all with a high quality relaxation & entertainment programme. We invite you, between the 1st and 4th of August, in Romania’s Carpathian Mountains for a journey that will reshape your mountain biking foundations. Amateur participants who are not yet ready to cope with 4 days of racing can opt for the 1-Day Challenge event, being scheduled on the 4th of August, on a shorter route, 43 km long and with 1,800 meters of climbing. Since its first edition, the Carpathian MTB Epic event has been quickly labelled as one of the most spectacular competitions in Europe, due to the special aura of the lands, the full package of services, the exceptional promotion and the quality of the organization. Athletes from over 22 countries join us each year for an unforgettable journey that is all about pushing your limits to the edge, building character, forging new bonds of friendship with passionate riders and experiencing the most EPIC tracks labelled by participants as iconic and breath-taking. Entries are open exclusively online, on carpathianmtb.ro. Special fees are available for cycling clubs affiliated with National Federations and for large groups of riders. Rediscover the true nature of mountain biking! Carpathian MTB Epic – Wild. Rugged. EPIC. The standard price for the 4-day EPIC race includes a full-service package, with accommodation - 3 nights during August 1-4, meals and race services. Upgrades are available for purchase separately, during the registration process. Full description of the all-inclusive packages are available on the official website: click here. Adventurous racing for Pirmin Sigel from the BIKE Junior Team powered by Bulls: The U23 rider races through the stage race Carpathian MTB Epic through Romania and reports daily. Prologue race report. Adventurous racing for Pirmin Sigel from the BIKE Junior Team powered by Bulls: The U23 rider races through the stage race Carpathian MTB Epic through Romania and reports daily. Stage 1 race report. Adventurous racing for Pirmin Sigel from the BIKE Junior Team powered by Bulls: The U23 rider races through the stage race Carpathian MTB Epic through Romania and reports daily. Stage 2 race report. Adventurous racing for Pirmin Sigel from the BIKE Junior Team powered by Bulls: The U23 rider races through the stage race Carpathian MTB Epic through Romania and reports daily. Stage 3 and conclusion.